Cuché tango is an Argentinian duo formed by Aldana Lezcano and Gustavo Manuel García Noya that honors the great tango classics in a not so classic way. 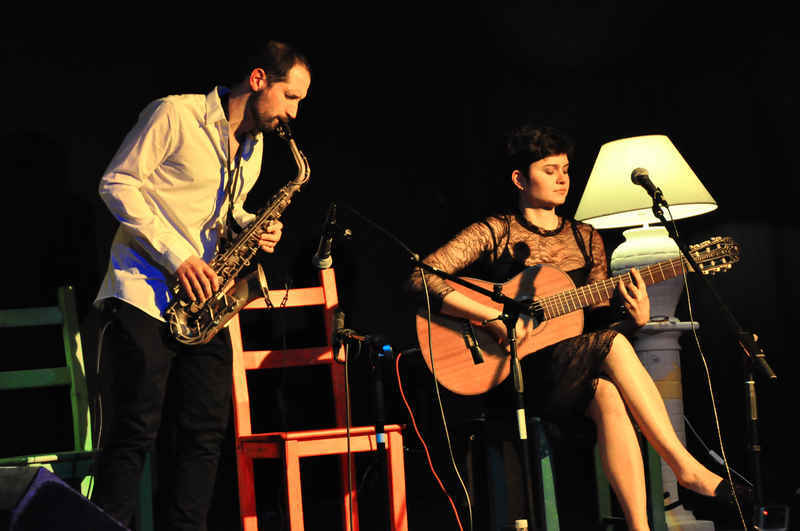 Combining a guitar, a voice and an alto-saxophone, they play classics and, in addition, some songs from other popular genres interpreted as tango. Cuché tango is an Argentinian duo formed by Aldana Lezcano (guitarist and singer) and Gustavo García (saxophonist) that honors the great tango classics in a not so classic way. Not so classic way, because the combination of alto saxophone-guitar is not a traditional format of this genre. Not so classic way, because instead of just being background music, our street musicians’ souls seek to interact with the audience, making them part of the show. Not so classic way, because we also like to select some songs from other popular genres and interpret them as tango. Combining its passion for music with its love of traveling, Cuché tango has managed to perform at festivals, milongas, restaurants, clubs and in the streets of different cities of Argentina, Denmark, France, Germany, Spain and Switzerland.